Recent research has demonstrated the relevance of the Sonic hedgehog (Shh) signaling pathway for maintaining BBB integrity and the loss thereof in brain aging and neurocognitive disorders [10–13]. In the adult brain, astrocytes secrete Shh. Upon secretion, Shh binds and inactivates its receptor Patched-1 (Ptch1), which results in the activation of Smoothened (Smo) and subsequent activation of Gli family transcriptional factors including Gli-1 [10, 14]. While the complete functionality of the Shh signaling pathway is not known, recent studies show that netrin-1 plays an important role in Shh-induced upregulation of TJPs, which are critical for maintaining the selective permeability of the BBB [10, 13, 15, 16]. Despite advances in antiretroviral therapy (ART), HIV-infected patients continue to suffer from HAND, which have been commonly linked to the breakdown of the BBB [17–19]. Previous studies clearly demonstrate the advantages of using a simian immunodeficiency virus (SIV) macaque model to imitate BBB breakdown in the brains of HIV-infected patients [20, 21]. Using this model, we studied changes in Shh signaling and neurovascular supporting cells in the brains of uninfected adult macaques (UI), SIV-infected macaques with no signs of encephalitis (SIVnoE) or with encephalitis (SIVE). A better understanding of the effects of HIV/SIV on the Shh pathway and periendothelial support structures at the glio-vascular interface will help identify potential therapeutic targets to reduce BBB breakdown in HIV-infected patients. Shh has been noted as a significant factor in damage repair across multiple neurocognitive diseases and disorders including MS and ischemic brain injury, as well as HAND. Shh has been seen in astrocytes in all stages of MS lesions as well as in normal appearing white matter within the MS brain, but high levels of Shh + macrophages tend to be present in demyelinating lesions and less so in remyelinating lesions, which primarily house Shh + axons [10, 29, 30]. 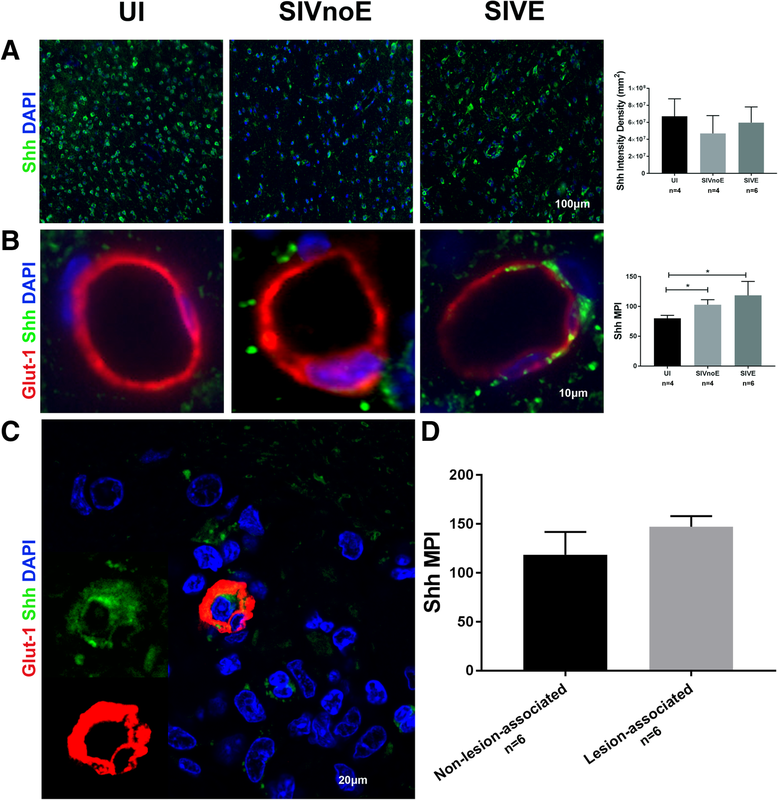 A similar increase in Shh is found within areas of ischemic stroke, and an inhibition of Smo has been shown to prevent natural recovery, while eliminating Shh has been shown to reduce the number of regionally produced Olig2+ cells during the post-ischemia recuperation process [11, 31–33]. These studies and many others show the reparative abilities of Shh within the glio-vascular unit, but recent studies have suggested that HIV is capable of disrupting the production of Shh preventing its continued maintenance and repair of the BBB . 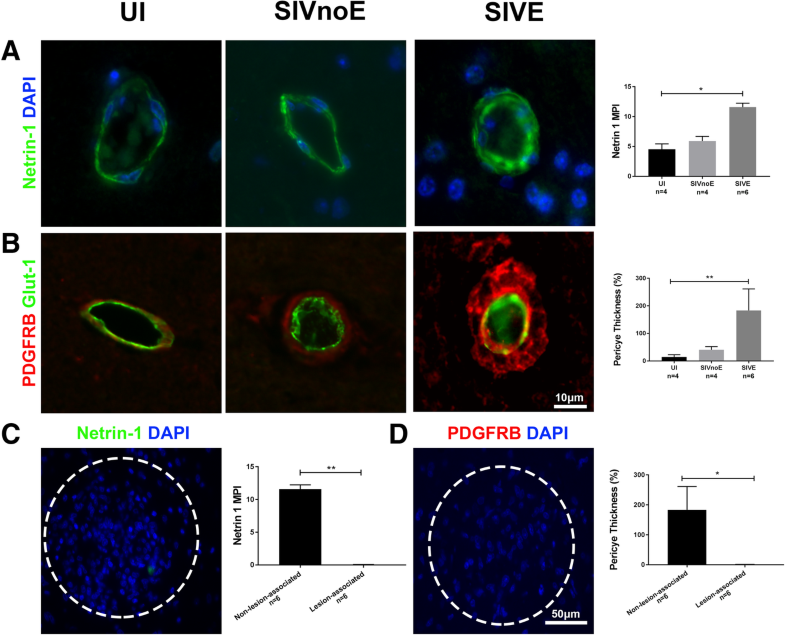 Despite the presence of Shh in the brain of SIV-infected macaques, the loss of netrin-1 within SIVE lesions suggests that a downstream disruption of the Shh pathway may play a role in BBB breakdown. 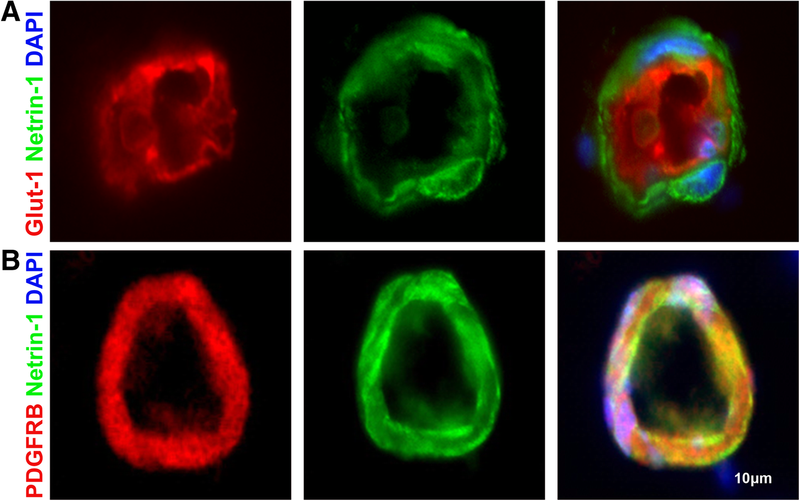 Evidence suggests that the loss of netrin-1 is likely due to the loss of its host cell, the pericyte, which become hypertrophied in association with HIV/SIV infection of the brain, and is absent in encephalitic lesions. Pericyte dysfunction is not unique to HIV/SIV infection. 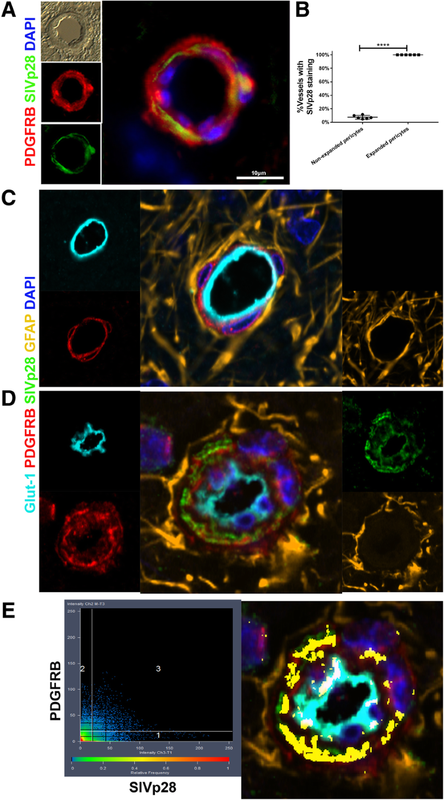 Previous studies suggest that pericyte dysfunction may play a key role in diseases like AD, cancer, seizure disorders, and even natural aging. 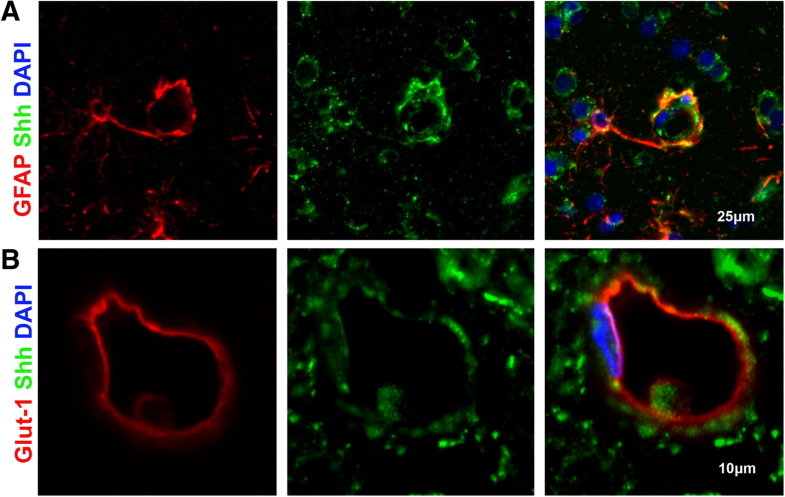 Pericytes have been a key target in AD research due to their ability to traffic amyloid beta deposits in the brain back into the bloodstream for removal by other organs, making their dysfunction likely to result in AD-like brain pathology [34–39]. 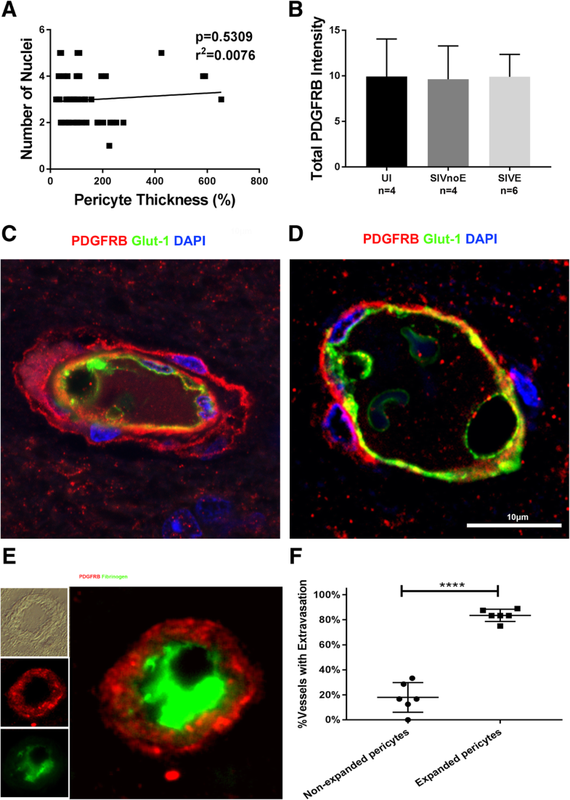 Recently, high numbers of cells expressing NG2, a commonly used pericyte marker, have been seen within high-grade choroid plexus tumors suggesting a potential role for pericytes in cancer . Pericytes have also been suggested to be involved with the cerebrovascular rearrangement seen in seizure patients . Changes in pericytes during normal aging have been linked to localized hypoxia as well as BBB leakage and an increase in neurotoxicity within the brain . Studies with animal models of traumatic brain injury suggest that pericytes play a key role in the construction and repair of the brain’s microvascular structures [43, 44]. Although studies investigating the effects of HIV/SIV on brain pericytes reported an overall decrease in pericyte coverage [45–47], we found that pericytes around many of the vessels in SIVE animals are becoming hypertrophied. This suggests that they may be undergoing functional changes or damage prior to being eliminated upon lesion formation. While no ART-treated animals were investigated in this study, Fig. 8 shows that both pericyte thickness and fibrinogen extravasation are positively correlated with the severity of SIVE suggesting that pericyte hypertrophy may continue to contribute to BBB disruption even in virally suppressed individuals.